Below you can view all the homes for sale in the Rivertowne subdivision located in Mount Pleasant South Carolina. Listings in Rivertowne are updated daily from data we receive from the Charleston multiple listing service. To learn more about any of these homes or to receive custom notifications when a new property is listed for sale in Rivertowne, give us a call at 843-306-2224. From the breakfast nook you can enjoy views of the pond or step out onto the smaller private back porch and enjoy the patio. The MLS#19010884. Carolina One Real Estate. 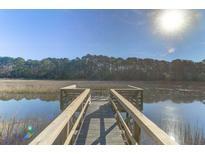 This section of Rivertowne has it's own Dock that you can tie up MLS#19008333. Carolina Elite Real Estate. Upstairs is a Master Suite, three large bedrooms and a full bath. MLS#19006866. The Boulevard Company, Llc. You may want to stay for the grand finale...sunset over the Wando River. Stunning. MLS#19005895. The Boulevard Company, Llc. The beautiful gourmet kitchen features granite countertops, two sink stations, two Bosch dishwashers and two appliance garages to keep the counters neat.Beautiful Wolf range with dual fuel, and four gas burners and double griddle, plus two ovens and pot filler water faucet will delight amateur cook and chef alike.The family room with MLS#19005771. Carolina One Real Estate. The family room opens up directly into the kitchen with an ample breakfast bar, pristine white cabinetry, an island, wet bar and granite counters with matching backsplash behind the gas range. MLS#19003237. Keller Williams Realty Charleston. Charming shake detail on the front gable, a beautiful wood and glass front door, tall ceilings, hardwood floors, interior doors with transoms, milled trim work and multiple high end finishes cover every appointment. (see more) MLS#18032411. The Boulevard Company, Llc. The first floor Master Suite has French doors that lead to the porch plus a large frameless glass shower, fashionable garden tub and walk-in closet. MLS#18024603. Carolina One Real Estate. The gas log fireplace with custom mantle and true raised hearth is flanked by built-ins with arched openings. A brand new MLS#18020096. Carolina One Real Estate.